Visitation will be on Wednesday, April 17, 2019 from 4-8 p.m. at Keehr Funeral Home, Spring Valley and one hour prior to the service at church on Thursday. Funeral will be at 11 a.m. on Thursday, April 18, at Gilman Lutheran Church, Spring Valley. Arnie was born January 3, 1931 to Carl and Elvina (Anderson) Brorson in Gilman Township, Pierce County, Wisconsin. He was baptized and confirmed and a lifelong member of Gilman Lutheran Church, Spring Valley. Arnie attended Spring Valley Schools and graduated with the Class of 1949. In 1951, Arnie entered the U.S. Marine Corps and served 2 years. On August 27, 1955 he married Dorothy Timm at Wilson Lutheran Church. They were blessed with 3 children: Dawn, Duane and Deanna. Arnie worked for Ray Hammond for a while, and then worked at the Spring Valley Elevator for 4 years. He worked for Everett Brown Plastering from 1957 until 1970. He then went to work for Ralston-Purina in Hager City and retired in 1993. He assisted at Keehr Funeral Home from 1995 until 2008. His favorite pastimes were golfing, hunting, fishing, and bowling. 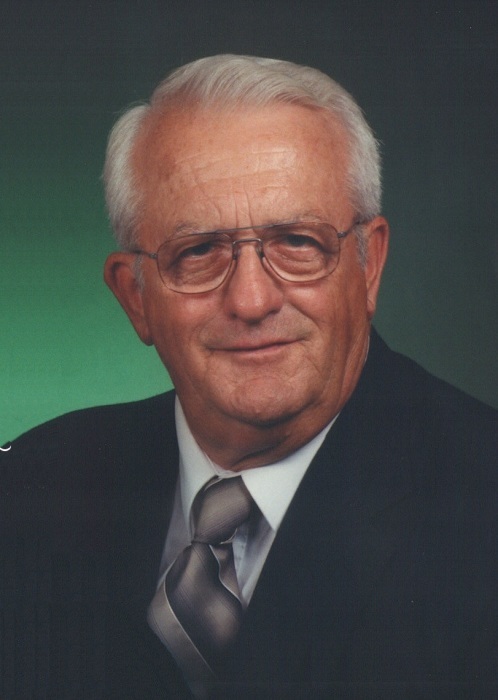 He served on Gilman Lutheran Church Council and was president for many years. He was a member of the Spring Valley School Board and volunteered for 25 years on the Spring Valley Fire Department, 12 of those years he served as fire chief. Preceding him in death were his parents; wife Dorothy in 2013; sisters: Evelyn (Corvin) Halvorson; Audrey (Mike) Grant; brother Dale (Gladys); and brothers-in-law Roy Johnson, Rodney Timm, and Dennis Timm. Survivors include his three children: Dawn (Steven) Wood of Elmwood; Duane (Elaine) Brorson of Spring Valley; and Deanna (Jeff) Powell of Spring Valley; 6 grandchildren: Jason (Avril) Wood, Ben Brorson, Pam (Tim) Gartmann, Mandi (Corey Norby) Wood, Lynnette Wood, and Nova Wood; 9 great grandchildren: Jacob and Courtney; Cori and Aubree; Kaydence and Brayden; Emelynn and Henry; Amber; Jesse; Kloe and Kyra; Stephanie and Brittney; 3 great great grandchildren: Theo and Ellie, and Claira; sister Joann Johnson of Spring Valley; in-laws: Mary Timm, Jan Timm, Don & Arlys Olson (all of Menomonie), Jerry & Sandy Timm of So. St. Paul, MN., many nieces, nephews, other relatives and friends. Funeral Service is Thursday, April 18, 2019 at 11 a.m. at Gilman Lutheran Church, Spring Valley. Visitation is from 4-8 p.m. on Wednesday, April 17 at Keehr Funeral Home, Spring Valley and also on Thursday from 10-11 a.m. prior to the service. Military honors by Spring Valley American Legion Post 227.